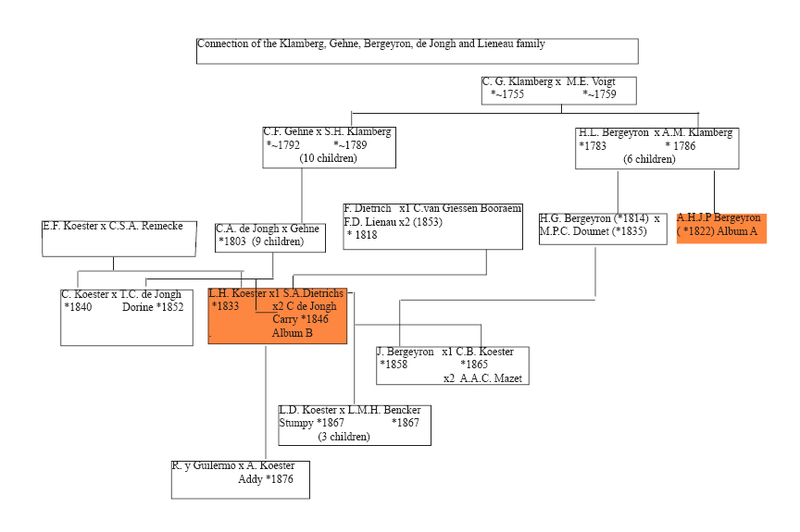 It all started with the marriage of my ancestor the judge Coenraad Alexander de Jongh (1803-1873) in 1843 with Augusta Carolina Gehne (1824-1891 daughter of teacher Carl Friedrich and Sara Hester Catharina Klamberg in Semarang (Samarang), a town on the North coast of middle Java. They had 11 children of which 7, reached maturity. 4 boys and 3 girls. His wife with the children went to Holland in 1857 to take care of their education and he followed in 1863. When Coenraad Alexander died in 1873 his three daughters Caroline born. 1846, Augusta born 1850 and Dorine born 1852 where considered at that time too young to live on their own. Unfortunately their mother was hospitalised and there where not many options within the direct family. Their grandparents were already deceased. It was decided that they would go to a sister of their grandmother from mothers side old-aunt Anna Maria Klamberg married with a French teacher with the name Honoré Louis Bergeyron in 1812 in the Hague. Later the couple moved to the upper south of France to Cette (Sète). He became merchant and Dutch consul. They had a daughter Adele Bergeyron (born 1822) of the generation of the mother of the girls . Dorine and later also Augusta followed. Cette at the time was an international wine export port with many wine merchants from Western Europe particularly Dutch and north Germans. Because of the influx of those foreigners there was a Lutherian church which was the religion of both the De Jongh and the Klamberg family. All three de Jongh sisters married in Cette. Carolina in 1875 with a German named Louis Henri Koester (* 1833 Hannover), a wine merchant, widower of Sara Adeline Dietrichs with two children. The couple had a daughter of their own named Addy born 1876. Dorine married Charles Frederic Adolph Koester (*1840 Hannover), a brother of Louis in 1880 and Augusta a Dutchman named Alexander Niemeyer. Dorine had no children. She died in Holland in 1930 and is burried in the same grave as my great-grand parents. My grandparents De Jongh met with Addy in 1964 for the last time and also had contact with the descendants of Augusta living near Paris. In 2006 I came into contact with Michel Lanneau from Paris who kindly borrowed me two old photo-albums having belonged to the family for scanning for which I am most gratefull. In the albums portraits of a wide group of people from different nationalities are collected. Most of them appear to be family. Some of course are friends. Apart from Dutch (also from the Dutch Indies) French and Germans, which follow from above. There are also portraits from England (Probably from the MacLachan_Gehne family via the mother of the girls De Jongh ), the USA ( The mother of Adeline Dietrichs, living in New York remarried with architect Detlef Lienau (from Slesvig-Holsten then part of Denmark, Dutch: Sleeswijk Holstein.) and Spain.